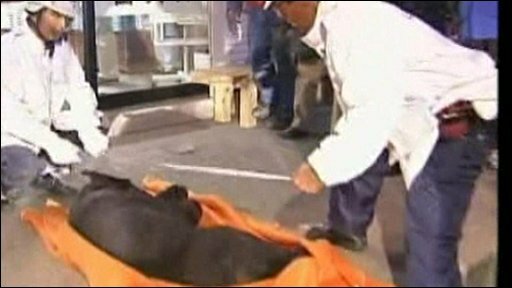 An Asian black bear has been shot dead after attacking a group of tourists at a bus station in central Japan. Four people were seriously injured in the attack in Takayama, Gifu prefecture, according to the Japanese news agency Kyodo. After the attack, the 1.3m (4ft) bear fled through the bus terminal, and into a souvenir shop. Employees then trapped it inside the shop, and the bear was later shot dead by officials. The male bear attacked a group of nine people, mostly tourists who were visiting nearby mountains. According to Kyodo, four men were seriously hurt, with injuries including facial bite marks. "I saw a man being attacked by the bear," one eyewitness told reporters. "I tried to help him but the bear kept attacking him. It seemed his face was seriously injured." An expert on Asian black bears told Kyodo it was unusual for them to attack humans.